That wire or barbed wire could become a feature of sustained poetic interest would have seemed inconceivable before WWI began. A late nineteenth-century innovation (and credited to Joseph Glidden in Illinois), the term had, in fact, been omitted from the first edition of the Oxford English Dictionary in yet another instance which challenged its intended status as ‘inventory’ of the language as a whole. ‘Of a horse’, the OED instead specified under barbed, describing an animal which is ‘armed or caparisoned with a barb’. That steel and iron could be barbed or hooked was confirmed by evidence from the Bible, as well as eighteenth-century translations of the Odyssey or, most recently, a translation of Homer’s Iliad from 1870. In the dictionary, barbs are described in relation to spears and arrows, plants, and hooks — but not wire. Only in September 2009 would barbed wire gain its own entry in the OED (here as part of the on-going revision for its third edition). Even if it had been used in conflict before the onset of WW1,it is clear that the use of barbed wire after 1914 would capture attention, and imagination, in highly distinctive ways. Long before Wilfred Owen, barbed wire could serve as a form of shorthand for human vulnerability, and the toll that war could bring. An article in the Daily Express in May 1915 focusses, for example, on the ‘death-tortured no-man’s land’, depicting the ‘bullet-ploughed ground between the blood-spattered hedges of barbed wire’ (Daily Express, 15 May 1915). Clark’s private life, too, confirmed its pervasiveness. A letter from his brother in Scotland commented on the wire-entanglements along the coast in Scotland in November 1914. Clark’s diary in December 1914 likewise provides a careful description (and diagram) of a barbed-wire entanglement as encountered on a visit to the training camp in Braintree; its short stakes are connected by two rows of wire, and with additional wire looped and relooped between the rows to form an intentionally impermeable defence. Yet, as Clark added, entanglement in this sense was another absence from the OED as it then existed. Added later, the dictionary would usefully track usage back to 1834. It provided, too, the definition, 3. Mil. An extensive barrier arranged so as to impede an enemy’s movements; an abatis formed of trees and branches, or an obstruction formed of stakes and barbed wire. Yet, as Clark would have commented, this arguably misses the point, as least as far as Words in War-Time is concerned – in WWI, the key issue was the seamlessness by which wire and entanglements came to be yoked together – in language as in life. ** Features such as these, and their frequent iteration whether in popular news reports and private letters, combined to give the resonant image of ‘the wire’ in the diction of WW1 – where the ellipsis of the characteristic barbed serves as an all too eloquent testimony of the prevalence, and deadly familiarity, of this aspect of conflict. 1834 J. S. Macaulay Field Fortif. iv. 83 The boughs of the brushwood..interlacing with one another, will thus form a very good obstacle, called an entanglement. 1876, 1879 [see wire entanglement]. 1899 Westm. Gaz. 17 Nov. 2/1 Where a wood enters into the scheme of defence, an abattis–in this case called an ‘entanglement’–forms naturally one of the best resources of the defenders. 1916 ‘Boyd Cable’ Action Front 47 Slowly and cautiously, with the officer leading, they began to wend their way out under their own entanglements. 1917 [see wire n. 1 e]. There is no trace of that “nerviness” so noticeable among the recruities of the early days of South Africa. as a first-hand account in the Daily Express of 2nd September 1914 proclaimed. ‘Noise seems to count for a lot with the Germans’, another report (in the same newspaper) laconically observed on 19th September 1914. It’s the quantity, not the quality of the German shells that is heaving effect on us, and it’s not so much the actual damage to life as the nerve-racking row that counts for so much. The noise of battle – and the extent of mechanised warfare across a front which, even in early September, stretched, for instance, from the Vosges to Peronne (as the Scotsman reported), was unparalleled. Shells and shrapnel repeatedly scream and screech across the skies (in a range of new collocations of English), testing the nerves as well as bringing danger in other forms: ‘The scream of shrapnel did not daunt us and, yelling and shouting, we became frantic and so did our horses. The rifle fire was soon silenced, as we must have ridden down the German infantry and cut them to pieces’, as an article in the Evening News stated on 29th September 1914. ‘The shells screeched hour after hour’, the Scotsman notes on 17 September 1914. The men were faced by a ‘terrestrial thunderstorm’, as the Evening News commented on 19th September 1914, attempting to suggest somehwar of what modern battle was like. as a lengthy and descriptive article in the Scotsman stated on 28 September 1914. This confirmed, too, a new (and newly familiarised) sense of shrapnel, by which it came to be understood as ‘fragments from shells or bomb’s, rather than explosive shells per se). 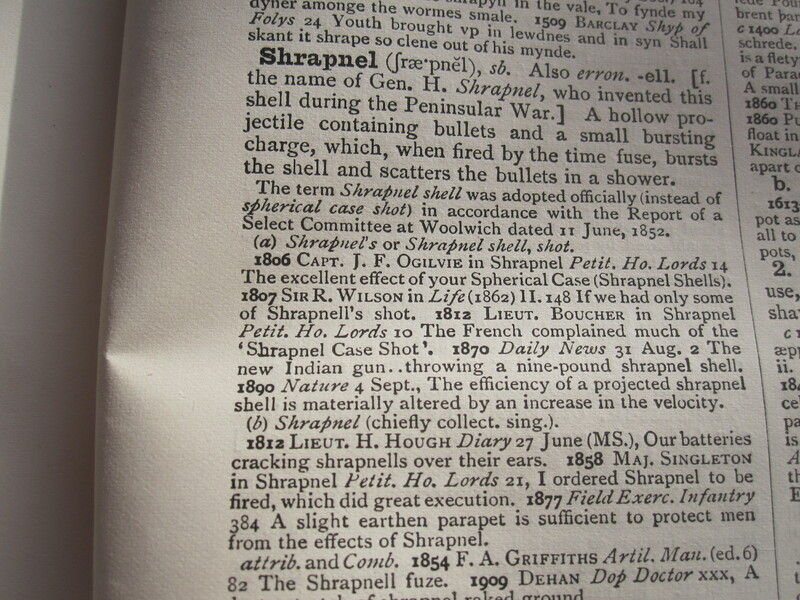 Shrapnel was documented in the OED in this sense from October 1914 (in a section revised in June 2014). Here, too, Clark’s evidence antedates the formal record of English and its history. News discourse, as Clark notes, could strive for a marked sense of the onomatopoeic in this respect. The rattle of the machine guns supplemented the noise of the naval guns. Then the field artillery added to the chorus. But all this noise could not drown the irregular rat-tat-tat of the infantry’ [ ‘British Squadron off the Belgian Coast: Shelling the Germans’, Scotsman 21 October 1914]. Likewise, the Daily Express on September 2nd draws attention to the ‘r-r-r-r-r–h of the Maxims’, while ‘the peculiar zh-zh-zh-zh of the shrapnel’ featured in the Daily Express on 14th September 1914. ‘You could hear the mitrailleuse ta-ta, ta-ta, ta-ta’, wrote a journalist in the Daily Express on October 17th 1914, describing an ‘air-duel’; similar was the click-click-wh-wh-wh -of the murderous machine’, here in attempts to evoke the flight of an ‘aerial pirate’ over Paris in the Evening News on 3rd September 1914. Modern war-reporting can, of course, use not only print and the form of the written word, but also sound itself. In broadcast news, we can be offered an experiential directness – the war-reporter not only speaks directly, but the sounds of war can provide an all too evocative backdrop to events. Writing war in 1914 was very different; the BBC – and national radio — would not, for example, be formed until after the war. If we have war reports (and sound recording) for WWII, it was print which dominated in WW1. News reporting can, as a result, often engage with a determined attempt to covey the sounds and texture of war in ways which are highly distinctive. As a later post on this site will explore, however, other media were already starting to emerge. ‘The Cinemagraph is going to be a damning witness against the Germans in this war. The Kinemacolour pictures … reveal to those who cannot see it with their own eyes, the full tragedy of Louvain and the other towns destroyed by the Kaiser’s shining amour’, we are, for example, informed early in September 1914. ‘Pictures’ and ‘word-pictures’ would, in this respect, importantly come to co-exist. As Clark noted, this visual language was also absent from the OED as it then existed, offering still further scope for his documetnary ventures in the war of words. ** See nerviness OED Online (revised Sept 2003),sense 2: ‘The quality or condition of being nervous. 1916: Vera Brittain Let. 1 Sept. in Lett. Lost Generation (2012) 248. “To have the face of a leader of men strong almost to unscrupulousness combined with an almost entire absence of self-esteem, and an excessive reserve & nervy-ness & shyness, is certainly an incongruity”.